The oil and oil pastel paintings of Robert Heindel have inspired me for fifteen to twenty years, but you've probably never heard of him. Through this article I'd like to change that. This is one of four articles in which I will introduce you to five great artist/illustrators whose work taught me a lot about making art. I hope that by showing you their work and explaining how they made it, you will be inspired by the same lessons I learned from them. 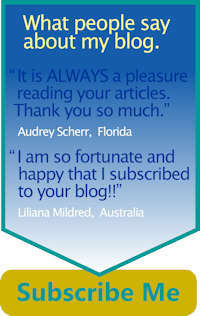 I hope you will be more than inspired; I hope you will incorporate these lessons into your own work, as I did. It doesn't matter what medium you use to paint. What you will see pertains to all of them. Back when I was first breaking into the illustration field, Robert Heindel was one of the top illustrators in the country. As just a quick aside, you might be interested to know that Robert began his art training by enrolling in the Famous Artists School correspondence courses. He studied art through the mail. While he may have started humbly, he reached the top of his field by producing work that was unique and imaginative, had great feeling and was art in every sense of the word. At the height of his illustration career he began pursuing a second artistic path, his love of dance, by painting dancers from ballet companies across the United States. He eventually left the illustration field completely to focus on painting dance and dancers. In my mind there was never a difference between his illustration and his fine art. He used oil and oil pastel in both and both were pure art. The oil and oil pastel painting below was commissioned for an advertisement for BASF Fine Chemicals, but it sure doesn't look like a typical advertisement. Robert stressed above all else that your work should have a good idea behind it. Your ideas are what make your work unique, not the painting technique you use to paint them. So what can you learn from his art? One of the first things you should learn is that using your imagination is the key to good ideas and there is great imagination at work in this oil and oil pastel painting. Look at what he did. 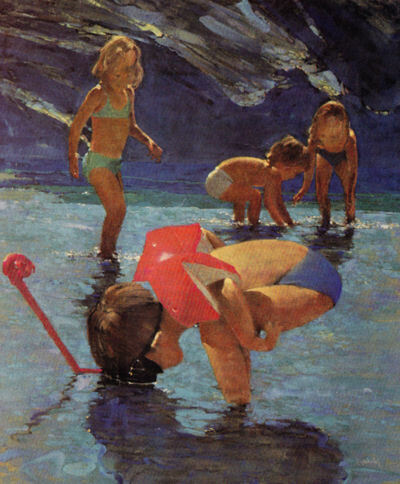 The star of this painting is obviously the boy in front. You know this, because Robert made him the largest element in the painting, gave his water wings the most intense color in the painting and the sunlight on his back creates the highest contrast in the painting. All these things capture your attention and create the star of his picture. One other thing Robert did in this oil and oil pastel painting is alter the laws of Physics. Notice the children in the background are backlit. The light on the boy in front is pretty much directly overhead. Does that really matter? No, because you probably didn't even notice. The difference in lighting also means the shadow the boy is casting is Robert's creation. 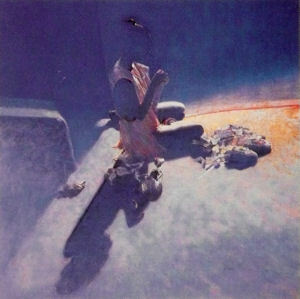 It is placed where it is for three reasons: it helps lead your eyes to the boy, it is consistent with the shadows of the other children and it is part of the visual path he created to move your eyes through the painting. Your eyes are attracted first by the red of the water wings and contrast of the boys back. The shadow leads your eyes to the boy's head where he gazes into the water. Notice the dark shadow and the boy's dark hair lead into the shadow of the girl standing behind him. The girl is less important, so she is painted very simply. Robert then painted an imaginary and pretty abstract wave behind her. He created this dark wave to make the background children stand out more and to have the lighter parts of it point your eyes to the children on the right. These children are also done very simply and their shadows lead you back to the boy in front, completing the visual path through the painting. 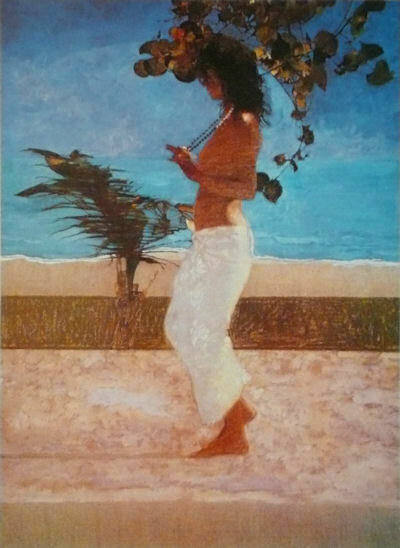 I want to emphasize again, what Robert did in this painting, you can do in yours. These aren't things you can only do with oil and oil pastel. They aren't things you can only do if you paint water or children. Being able to simplify by seeing simple shapes, being able to draw and paint based on your knowledge of simple shapes and combining that knowledge with your imagination are what make for truly unique art. Look at another example of Robert's work. Robert liked to paint with oil and oil pastel on Belgian linen canvas, and he often liked to let the canvas show through in his work. This oil and oil pastel painting is deceptively simple. There are only a few elements in it, so each one has to be just the right value (lightness or darkness of the color) and be in just the right place for this design to seem balanced. The upper half of the painting is just sky and sea with only a subtle color change to differentiate them. An irregular white line of paint let's your imagination read it as surf. Below that he lets the unpainted canvas show and then an olive/brown band of oil pastel only roughly colored in. This band creates texture and heightens contrast with the woman's pants which helps draw your eyes to her. She is done very simply with oil pastel scumbled across the canvas, though not completely covering it. This oil and oil pastel painting is a good example of why some of Robert's peers used to kid him that he kept getting paid more and more to paint less and less. The lessons you should learn from this are again how vital imagination and design are to the success of your art and how much detail you can leave out and still have the viewer understand and love what you paint. In fact, the viewer may love it more, because when you focus only on what is important, the viewer's imagination will supply the rest. I want you to notice in each of these paintings that they both leave out a lot of detail, but the detail that's there is masterfully handled to create visual surprises everywhere. Dancers' bodies blend into the background. Things fade off and reappear. A small highlight may be all that defines a head. Robert worked almost exclusively from photographs, but his imagination took his work far beyond what his photographs showed. Your imagination can do the same. It is just a matter of using it in everything you do. At first it may be hard to get ideas. But gradually, striving to create things uniquely your own will become ingrained and easier. If you study other artist's work and try the ideas you find there, it will help you imagine what is possible in your own. 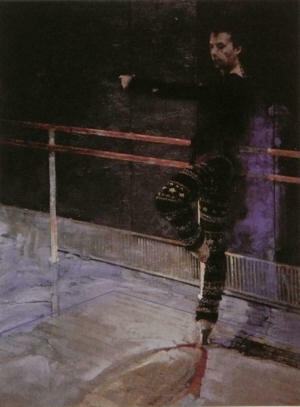 You can see more of what is possible in Robert Heindel's dance paintings by going to www.obod.com.